Boston police officers once again failed to wear their badges or identify themselves at a public event, but this time one of the 23 top ranking department officials called the department’s “command staff” was on hand to step in. Sadly, when Deputy Superintendent William Ridge did involve himself in the incident, he joined in with his officers in their unlawful behavior and took it a step further by trying to intimidate me. On July 4, the Boston police deployed outside of the Esplanade area where Boston’s Independence Day celebration is held. I was there to document the police checkpoints at the Esplanade itself, but on my way I noticed four Boston police officers standing in a doorway. Two of the rifle-toting cops were not displaying their badges, so I asked them to identify themselves. They refused. I then asked all of the officers to comply with the Massachusetts police ID card law that requires municipal police officers to carry and show a police ID upon lawful request. Three out of four of the officers refused and the fourth would only show his card to me off camera. During a recent appearance on WGBH's program Boston Public Radio, Boston Police Commissioner William Evans was asked about reports that police at protests in Ferguson, Missouri were using black tape to cover up their names to conceal their identities. Evans agreed with host Margery Eagan that it was unlikely such a thing would ever take place in Boston. Another killer with a badge walks free and we can’t breathe. Shortly before being suffocated to death by New York City police, Eric Garner declared “It stops today,” but it hasn’t. Across the country, the justice system has failed to hold police accountable, so on December 4, thousands of peaceful demonstrators gathered in Boston for the city's largest protest in recent memory. The #EnoughIsEnough protest was sparked by a grand jury’s refusal to indict Officer Daniel Pantaleo, who was caught on video choking Eric Garner to death, but protesters hoped to put that case in the context of a wider system of unaccountable police violence that disproportionately affects black Americans. The size of the protest and the tactic of splitting up and regrouping all over the city made it impossible to document everything that happened during the protest, so this video is only meant to shows some of the highlights of what we saw. The protest was primarily peaceful, but there were a few shoving matches between police and protesters at different points during the night. A small number of arrests took place, a few of which we witnessed. There was also an incident where a Massachusetts state trooper pepper sprayed a man for no apparent reason, which is not featured in this video. You can read more about the protest here. I used to live in Keene, New Hampshire and I've attended the annual Pumpkin Fest several times. It's always been a tame event, so I was surprised to hear that this year's festival was marked by drunken rioting, which apparently started when off-campus parties being attended by college students and out-of-towners grew out of control (don't blame the college or entire student body though). If you've been watching the news over the past few days, you're probably familiar with the scenes of people throwing glass bottles, ripping up streets signs, and even flipping over cars. Jared Goodell, a reporter who was covering Pumpkin Fest for Cheshire TV, the local public access channel, decided to speak about the rioting which was happening a few blocks away from the main street where the festival was happening. This apparently angered Pumpkin Fest organizer Ruth Sterling, who can be seen in the video below trying to stop Goodell's coverage. As you can see in the video, Sterling tried to block the camera used in the broadcast, tried to grab Goodell's microphone, and threatened to “pull the plug,” which would presumably mean tampering with cameras and other equipment that don't belong to her. Sterling told Goodell that he was a “guest” at a “private event,” neglecting to mention that Pumpkin Fest takes place on public streets, sidewalks, and parks in downtown Keene. She also accused Goodell of being a “Free Stater,” referring to the Free State Project, which aims to get libertarian activists to move to New Hampshire. Throughout the entire incident, Goodell showed an amazing amount of patience – far more than Sterling deserved. The incident was a bizarre sight, not just because of Sterling's childish behavior, but because she apparently actually believed that a public access channel with a tiny audience was somehow going to give her event a bad name. "I needed to keep 80,000 people safe. And one self-promoting punk could help me do that or TRY to impede me from doing that. I never regret when I try. Last night I was trying. I was not surrendering to fear, intimidation, threats," Sterling wrote. This is a classic case of projection. Sterling accused Goodell of “self-promoting” (for talking about something that had nothing to do with him, mind you) when she was the one who interrupted his broadcast because she was upset with the coverage of her event. She complained about “intimidation” and “threats” when she was assaulting Goodell and threatening to “pull the plug” on his broadcast. Thankfully, this incident has a happy ending of sorts, which is that Sterling's tantrum has become a viral video. The blog Free Keene uploaded the clip to their YouTube channel and it has already received nearly 100,000 views. I've seen the video played on several local news channels in Massachusetts and even national channels like Fox News. There was never a chance of a public access channel giving Pumpkin Fest a bad name, but Sterling has managed to that all by herself. Sterling and other would-be censors may want to brush up on the “Streisand effect” before pulling any more stunts like this in the future. According to CTV’s Executive Director Lee Perkins, after Sterling left the camera’s view she went around to each CTV crew member, including Perkins and demanded they take Jared off-the-air. They refused and she proceeded to search for the power adapter to literally “pull the plug”. She was unable to locate it and ultimately left. Free Keene also posted the clip of Goodell reporting on the rioting just before Sterling accosted him, which further shows just how ridiculous and unreasonable she was being. On Tuesday, October 14, medical marijuana patients and advocates gathered in Boston to protest the state's failure to guarantee access to the drug in the nearly two years since voters approved a ballot question legalizing it for medical use. Since then, the Department of Public Health (DPH) has not approved a single dispensary license and has instituted strict regulations that cripple the ability of patients to obtain marijuana from other sources. “It's unacceptable to make patients suffer for politics. The Department of Public Health has blood on its hands today,” said Mickey Martin, an activist and author who helped direct the protest with a bullhorn. Martin slammed DPH for the slow pace of its dispensary license approval process, noting that the agency has collected over $3 million in fees from applicants. “We demand that DPH put this program in place immediately,” Martin said. He said DPH should expedite the licensing process, issue licenses for every county in the state, and issue at least 35 licenses for the entire state, with a goal of 50 or more. Martin also said that DPH should loosen its regulations on caregivers, medical marijuana providers who aren't associated with dispensaries. Currently, DPH only allows caregivers to serve one patient at a time. Martin also said that patients should be free to grow their own marijuana. Currently, only 11 dispensaries have been allowed to move to the inspection phase, a number which Martin said is too low. “You're going to put a strain on the supply and limit what's available,” he said. Bill Downing, the owner of Yankee Caregivers, also emphasized the importance of caregivers. Downing is currently suing the Department of Public Health for shutting down his service which provided medicine to fifteen patients. “Caregivers don't make money for DPH so DPH doesn't like caregivers,” he said. Jill Osborn, who said her seven-year-old daughter Haley suffers from a severe form of epilepsy that causes as many as a hundred seizures a day, also spoke about the necessity of having a system of caregivers. “Even when dispensaries open, if they ever actually get open, they'll only cater to the needs of the majority of patients. We need to expand the caregiver program so that patients with unique needs, patients like Haley, who need specific strains grown for them get that access,” Osborn said. “I do not want seizures anymore, but I want medicine that can take them away,” Haley told the crowd of protesters. Cynthia Gedick also voiced her frustration over her inability to provide marijuana for her daughter Rebekah, who she said suffers from hippocampal malrotation and seizures. Gedick said the medications she is currently using to treat Rebekah have numerous side effects. After several other patients and advocates spoke, Cara Crabb-Burnham, the president of MassCann/NORML, spoke about efforts to legalize marijuana and urged the crowd of protesters to register to vote. “Marijuana will be legal in 2016. If the DPH cannot figure themselves out in that time, patients will have access with everyone else,” she said. Recent polls showing that the majority of Massachusetts voters approve of marijuana legalization support her prediction. After the press conference, the group marched from the Department of Public Health to the State House, where they continued to protest for some time. Jerry Donovan, who is confined to a wheelchair due to a spinal injury, told me near the end of the protest that marijuana is a safe alternative to pharmaceutical drugs that can cause liver damage. “It should be available so that your doctor can write out a prescription and it could be delivered to your door for people who are incapable of going and getting it,” he said. DPH told 22News that some dispensaries may open by the end of the year, but it is unclear how many. On Friday, September 5, family members, friends, and other supporters of Denis Reynoso marked the one year anniversary of the Iraq War veteran's sudden and violent death at the young age of 29. Reynoso was shot to death by Lynn Police Officer Joshua Hilton in his apartment in front of his five-year-old son. Reynoso was an Iraq War veteran who served with a unit that located and disarmed roadside bombs. After returning to the United States, he worked as a clerk for the Salem Post Office until his resignation at the end of 2012. He hoped to get a job as a firefighter and had passed the exam shortly before his death. He left behind a fiancée, two children, and an extended family. Friday was a mix of angry protest and solemn, sometimes tearful, mourning. Family members and supporters first gathered at the gates of the Pine Grove Cemetery, where Reynoso's body was laid to rest, then marched on the Lynn police station where they paused for a short demonstration. The day was sweltering, but a good Samaritan in a white pickup truck approached the cemetery gate shortly before the march began and offered the group cold, bottled water as a gesture of good will. Police officers driving unmarked vehicles monitored the group throughout the protest. We spotted several in a parking lot across the street from the cemetery before the march began. Police also followed the demonstrators as they marched to the police station. After the march, the group walked back to the cemetery. Several family members paid their respects at Reynoso's grave, which was decorated with flags, flowers, and photographs. One family member recited a prayer in Spanish. The shooting of Denis Reynoso was ruled justified by Essex County District Attorney Jonathan Blodgett, who explained his decision to clear the three officers involved in the shooting of criminal wrongdoing in a four-and-a-half page report released in January. According to Blodgett's report, police were dispatched to the apartment complex where Reynoso lived after receiving a call that he had been outside yelling at people and behaving erratically. Reynoso went back into his apartment before the police arrived, but they were directed there by several witnesses. The police entered the home, but said Reynoso grabbed one of their guns and managed to fire off two shots before one of the officers fired a fatal shot into his chest. People at the rally expressed skepticism about the district attorney's report, which left many lingering questions. There was no physical evidence linking Reynoso to the gun he allegedly fired. The DNA test performed on the gun was inconclusive and investigators did not find any gunshot residue on Reynoso's hands. Furthermore, the police reports and interviews with the three officers, which were obtained by The Bay State Examiner earlier this year by making a public records request, contained several contradictions. Matthew Krawitz said he thought Reynoso's military training and experience made the story seem implausible. “Someone who defuses bombs lunged for a gun in a holster? That is the most ridiculous thing I've ever heard,” he said during the march. Ultimately, there will probably never be definitive answers about what happened during the shooting and that uncertainty has worsened the grief experienced by Reynoso's family and friends. Jessica Spinney said that a year after the shooting, she still feels like she has “no answers” about what happened. “My whole life has gone down, but I'm getting back up there. We're all in counseling. That's pretty much what our schedule consisted of for the last six months. I'm getting back together, back at work. But as far as the DA or the Lynn police, there has been no other communication,” she said. Peter Alvarez, who just graduated from Boston University School of Law, said he only met Reynoso once, but became concerned about the shooting after hearing about it from his sister-in-law, who was Reynoso's cousin. Alvarez said he didn't think the police should have entered Reynoso's apartment in the first place. “There was no warrant to enter, there was no probable cause, and there was no emergency taking place,” he said. Alvarez spoke with us at length about reforms he believes are necessary for police to be held accountable and for families to get answers. He said that families of people killed by the police should be provided with basic documents such as incident reports within 48 hours. He also said the government should maintain a database of police killings so that it can be analyzed for trends. Alvarez also said there needs to be a system of independent investigations for killings by police. Alvarez and other family members had petitioned the police department early on for an independent investigation of the Reynoso shooting, but the investigation was handled by the local district attorney's office, which is standard for fatal police shooting cases in Massachusetts. Since at least 2002, district attorneys in Massachusetts have never prosecuted police officers for fatal shootings, no matter what the circumstances of the shooting were. Alvarez also said he supports the creation of citizen review boards with the power to control police department policies. “The people should be the ones to say when police discretion has went outside the bounds of what they're comfortable with. We have constitutional bounds, but we still should also have citizen bounds, what the community wants,” he said. Alvarez also spoke about the need for police departments to record officers with cameras. No major policy changes have been announced by the Lynn Police Department during the year since the Reynoso shooting. The only action proposed by Lynn Police Chief Kevin Coppinger was buying new holsters for his officers. The district attorney's report stated that Reynoso was able to easily disarm an officer because his holster was worn out and missing a screw. While the Lynn police do not seem very reform-minded, the recent events in Ferguson, Missouri that were catalyzed by the fatal police shooting of 18-year-old Michael Brown have given rise to a national conversation about police violence and accountability that hasn't been paralleled in decades. The Worcester Police Department recently announced that it was exploring the issue of body cameras, likely making it the first police department in Massachusetts to do so. With discussions about body cameras and other reforms mentioned by Alvarez becoming commonplace, we are inching closer to a world where the tragedy of losing a loved one to police violence will no longer be compounded by the pain of not knowing the truth about what happened. On Thursday, September 4, the Transformers fan who was accused of impersonating a police officer was vindicated after Magistrate Richard Bloom dismissed the case against him during a brief hearing at Quincy District Court. Zhang Zhijun, a 23-year-old civil engineer from Braintree, received a summons last month after he was stopped by police for driving around in a 2010 Maserati he had decorated to look like Barricade, a character from the Transformers. The vehicle bears some resemblance to a police cruiser, but says “Decepticons” – the name for the villainous, shapeshifting, alien robots from the Transformers universe – where most cruisers would have the name of the police department. The vehicle also says “to punish and enslave” in lieu of the usual police motto, “to serve and protect.” The vehicle has no lights or sirens on it that could be used to pull motorists over. Zhijun would have faced up to a year in jail and a $400 fine if the case went before a jury and he was convicted. “It would be very hard for the public to make a differentiation” between the Maserati and a police cruiser, Ware said. Ware said Zhijun told police that he was doing them a favor because people slowed down when they saw his Maserati, but this claim was disputed by the defense and Bloom said there was no evidence for it. Ware insisted that allowing Zhijun to drive around in his Maserati had the “potential to go seriously wrong” and alluded to a kidnapping in Avon that he said was perpetrated by someone pretending to be a police officer. Ware conceded that Zhijun had not directly represented himself as a police officer to anyone, but suggested that the police had “intercepted” him before he was able to. At one point during the hearing, Zhijun said he had removed some of the stickers that police had a problem with from the vehicle and Ware said this showed “consciousness of guilt,” but Bloom bluntly told him that wasn't a valid conclusion. Matson said Zhijun was not accused of misrepresenting himself as a police officer to anyone or of attempting to exercise any police powers, so the law was not applicable. Matson pointed out that police departments auction off retired police cruisers to the public. He also said that if the law was interpreted the way the police wanted it to be, people could be arrested for wearing police costumes on Halloween. At one point, Bloom asked Zhijun how much he paid for the car. Zhijun said he bought it second-hand for about $80,000. Ultimately, he agreed with Matson that the law had not been violated. “The key word in the statute is 'acts,'” Bloom said. Still, Bloom cautioned Zhijun, saying people might get concerned if they saw Maserati and report it to the police. "He's gonna have himself a problem," Bloom said. “There was no harm here. It was a lot of wasted time and energy and I think this really ran the risk of the police looking very silly,” Matson said. But it would probably be fair to say that the police looked worse than silly throughout this case. Ware, for instance, displayed an extreme lack of professionalism during the court hearing. At one point, he interrupted his presentation to yell at a man sitting in the gallery and demanded that he leave the courtroom, accusing him of talking. The man responded that all he had done was cough. Bloom attempted to calm Ware down and told the man that he could stay. Last week, when we went to the Braintree police station with a camera to ask about the Transformers case, Lieutenant Karen MacAleese told us we didn't have the right to record her voice without consent. In reality, there is no law in Massachusetts that makes it illegal to record anyone without their consent and the First Circuit Court of Appeals has ruled multiple times that people have a clearly established First Amendment right to record police and other public officials. MacAleese refused to tell us her name or show us her police ID card (as required by state law). She was not wearing a badge or name tag when she spoke to us. We later determined her identity by calling the police department. The Transformers case isn’t the first controversy the Braintree police have found themselves in the midst of in the past few weeks. Last month, Cape Cop Times reported that Braintree police had arrested a medical marijuana patient, taken cash and medicine from him, and refused to give it back after being ordered to by a judge. Instead of harassing Transformers fans, shaking down medical marijuana patients, and making up fake laws to try to intimidate journalists, the Braintree police should focus their limited time and resources on real problems plaguing their community such as unsolved murders. The Braintree police shouldn't be lecturing anyone about common sense until they can show a bit more of it themselves. *Disclosure: The Bay State Examiner has published writing by Russell Matson in the past. 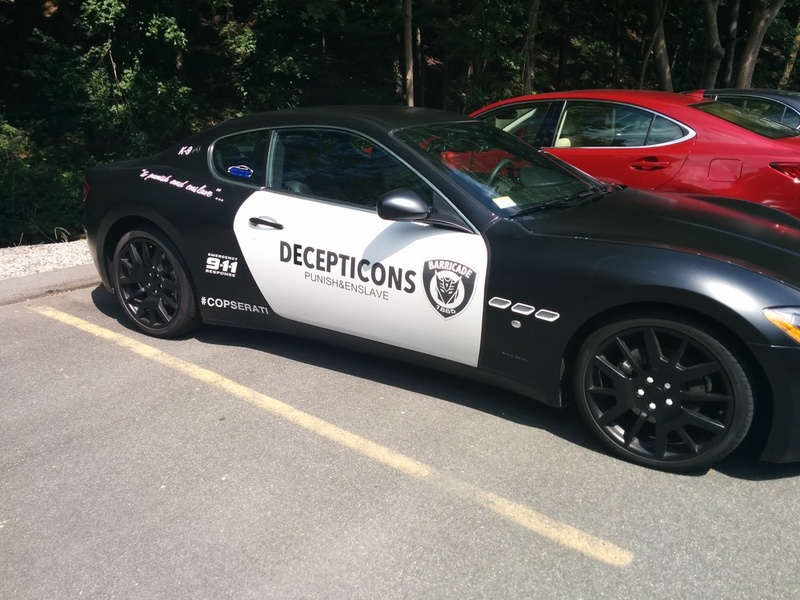 A Braintree resident found himself facing a court hearing for allegedly “impersonating a police officer” last month after he decorated his Maserati to look like Barricade, a character from the Transformers franchise. The man was pulled over on August 9 by Braintree Police Officer Brian Holt, who wrote in his report that he stopped the vehicle because he was not aware of the police department owning any Maseratis. Holt, another officer, and a sergeant took pictures of the vehicle and allowed the driver to go on his way. After consulting with Lieutenant David Delpapa, Holt requested that the man be issued a summons. Russell Matson,* a criminal defense attorney who is representing the man, said his client is innocent of any wrongdoing and that the police are wasting tax dollars by moving forward with the case. “Braintree police do not traditionally either drive Maseratis or have 'punish and enslave' written on the side of their police cars,” Matson noted. Matson declined to release the name of his client at this time, citing the man's desire to avoid publicity, but has said he's a University of Massachusetts-Amherst graduate in his 20s. The police report does not accuse Matson's client of misrepresenting himself as a police officer to anyone or of attempting to exercise any police powers, so the case does not appear to meet any of the criteria set forth in the law. The police report fails to mention that the vehicle said “Decepticons.” It also did not mention that the vehicle lacked lights and sirens that could be used to pull other motorists over. Matson was quick to point out that as absurd and comical as the case is, it is still a serious matter for his client, who faces up to a year in jail and a $400 fine if convicted. The Transformers fan faces a clerk magistrate hearing in Quincy District Court on September 4. The clerk magistrate will have to determine if there is enough evidence for a criminal complaint to be issued. Matson said he hopes to get the case dismissed during the hearing, but it's impossible to predict what will happen. We went to the Braintree police station to inquire about the case, but were met with hostility instead of answers. The officer we first spoke with said he could not speak to us about the case, but offered to get his lieutenant. When the lieutenant came out, she demanded that we turn off our camera and claimed that we didn't have the right to record her voice without her consent. In reality, there is no law in Massachusetts that makes it illegal to record anyone without their consent and the First Circuit Court of Appeals has ruled multiple times that people have a clearly established First Amendment right to record police and other public officials. When we repeatedly challenged her on the law, the woman told us that we could stay in the police station “all day” if we wanted, but that no one would answer our questions if we continued recording. She would not tell us her name or show us her police ID card (as required by state law), but she did say that her badge number was 73. She was not wearing a badge or name tag when she spoke to us. We later determined her identity to be Lieutenant Karen MacAleese by calling the police department. We ultimately left the police station without getting any answers since no one would talk to us on camera. The Transformers case isn't the first controversy the Braintree police have found themselves in the midst of in the past few weeks. Last month, Cape Cop Times reported that Braintree police had arrested a medical marijuana patient, taken cash and medicine from him, and refused to give it back after being ordered to by a judge. The Bay State Examiner will be reaching out to Mark Wahlberg, an actor from the Transformers movies who is himself from Braintree, as well as Michael Bay, the director of the movies, to ask them to weigh in on the case. WCVB notes that since the current police chief has taken over, the department has adopted a "zero tolerance policy" and made being convicted of a crime a fire-able offense. But that still raises the question of why the department hasn't always fired officers who were convicted of crimes and why it can't go back and fire officers who were convicted of crimes in the past. A Revere Police Officer resigned earlier this year after admitting that he stole money used in a controlled drug buy last December. Former Officer Carlos Amaro resigned several months ago when faced with the allegations, but City officials have been slow to confirm or explain what led to that resignation. Just recently, in a filing on an unrelated case, Suffolk County District Attorney Dan Conley’s Office detailed the circumstances surrounding Amaro’s resignation. According to that document, on Dec. 27, 2013, Revere Police had been conducting a drug investigation and executed a search warrant at the target’s apartment. Inside the target’s coat, police located an unknown amount of cash that had been used earlier in a controlled, undercover drug buy. The DA’s filing indicated that Officer Amaro stole the money in the coat between the initial Revere Police search and the follow-up search by the State Police. It also indicated he admitted to the theft. This past Monday's rally outside the Tewksbury Market Basket was incredible. I grew up around the corner from the Tewksbury store where the rally was held. That store has been where my family shopped for about the last two decades. As a little kid, I was bribed with candy for good behavior when I accompanied my mom as she shopped… so for me walking the half stocked aisles of the uncharacteristically empty store struck me as something out of a very personalized apocalypse movie. My mom has called it the “Moscow Mart” for years, claiming that they find the items she likes and stops carrying them and yet she has shopped at Market Basket loyally for most of my life. There was a huge crowd gathered combining both management and the workers and all they want is their old CEO back. Typically when there is a strike it’s about a negotiation, but this is something entirely different. The Market Basket folks aren’t demanding money or compensation they have one demand: reinstate Arthur T. Demoulas. I interviewed an employee and he spoke about his respect and affection for Demoulas. The turnout shows his views are widely held by Market Basket employees. Speeches by employees at the rally focused on the leadership style Demoulas displayed, highlighting the care that he has shown time and again for the employees of Market Basket. The other highlighted aspect that was hit upon was the success of Market Basket under Demoulas attributed to a lack of greed. Market Basket employees see the board removing Demoulas and other moves related to it as a greed driven attack on the entire franchise which they won’t stand for. Good for them. Yellow caution tape tied to overturned Market Basket carriages cordoned off the wide swath of parking lot at Stadium Plaza where thousands of protestors gathered to call for the return of ousted grocery chain president Arthur T. Demoulas. They waved signs, tooted horns, and cheered in support of the executive, who was fired in late June. Monday’s rally came a day after eight senior employees, several of them organizers of the protest campaign, were terminated from their jobs.